Orange County Fire Rescue will participate in a variety of outreach activities in support of Fire Prevention Week, which runs October 8 through October 14, 2017. This year’s campaign, “Every Second Counts: Plan 2 Ways Out!” focuses on the significance of creating a home fire escape plan, as well as the importance of practicing that plan. The events planned for Fire Prevention Week are great opportunities to increase public awareness and communicate fire safety to citizens of all ages. Those interactive activities include fire station open houses, visits to Orange County Public Schools and local daycares, and smoke alarm blitzes around several local neighborhoods. This year’s message, “Every Second Counts: Plan 2 Ways Out” encourages citizens to draw a map of their home, making two exits from each room and a path to the outside from each exit. It is especially important to rehearse the home fire drill twice a year, once at night and once during the day, so all members of the household are prepared, regardless of the hour. Fire Prevention Week is the longest running public health observance, with commemoration beginning in 1922. Fire Prevention Week themes over the last nine decades include Your Life, Your Property, Learn Not To Burn and Hear The Beep Where You Sleep-Every Bedroom Needs a Working Smoke Alarm. For more information about Fire Prevention Week, visit the National Fire Protection Association (NFPA). For more information about Orange County Fire Rescue, as well as emergency and safety information, visit www.ocfrd.com, or contact Kat Kennedy, Public Information Officer, by calling 407-836-9074. 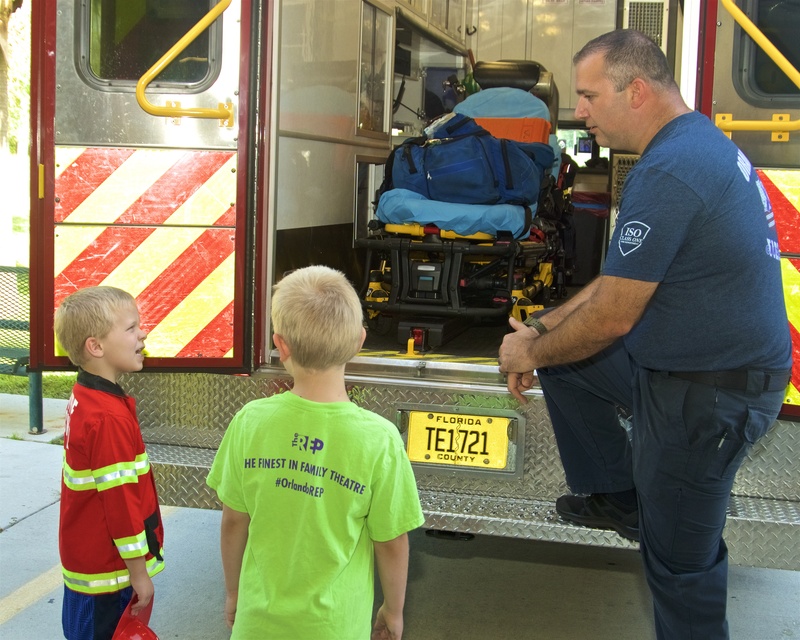 Featured Photo: Orange County Fire Rescue helps educate citizens at Station 51’s Open House during Fire Prevention Week.